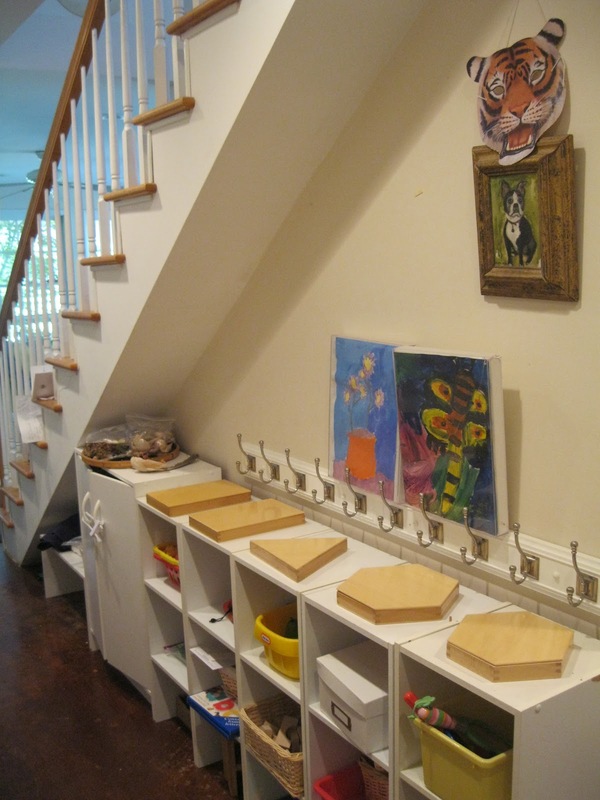 Montessori Messy: Open Shelving: Please Touch! It's important for toddlers to be able to reach stuff they are allowed to use and to NOT be able to reach stuff they are NOT allowed to use. That's why my house has a ga-zillion step stools and the teenagers' rooms are as secure as Fort Knox (safety gates galore). For things it's okay to use I have lots of different kinds of open shelving--most of it cheap. In the photo above there are tons of those melamine closet organizers along one wall of our hallway with a picture ledge from Ikea a little higher. Sometimes it holds books, right now it holds Dressing Frames. I do have some special shelving that I splurged on (you can see one in the left of the above photo). 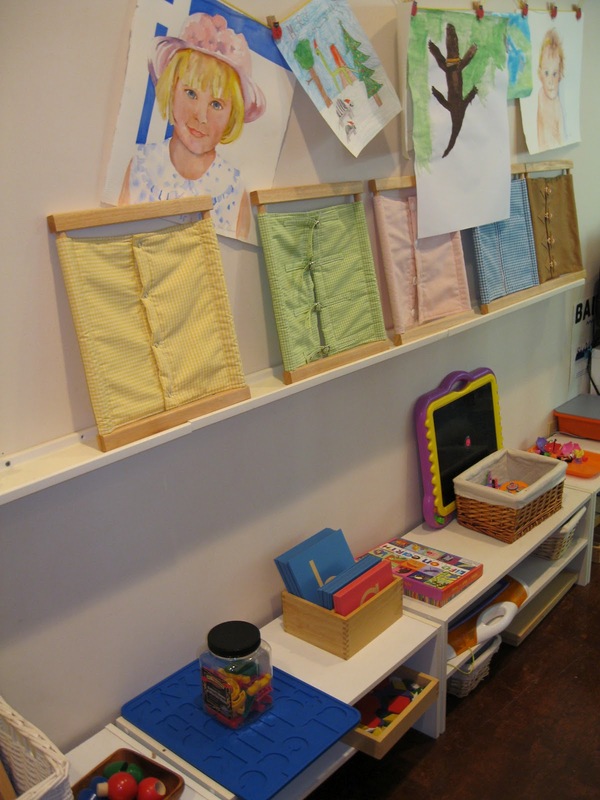 The specialty shelves fit the Montessori equipment perfectly and sometimes go on sale at Lord Equipment Company. In the kitchen I have cheap shelves from office supply stores that kinda match (during sale season I think they were about $17 at Office Depot?). 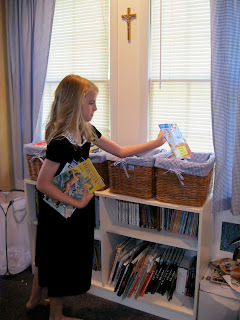 I also repurposed several cubbies from Target that we've used in the kids' closets off and on. In the sunroom there's one long bench that can serve as shelving. I've seen makeshift classrooms with long wooden boards and cinder blocks used as shelves, but you'd have to be pretty sure that no one would be getting hurt around those! As long as it's safe for the purposes intended, any affordable solution you can imagine will work. 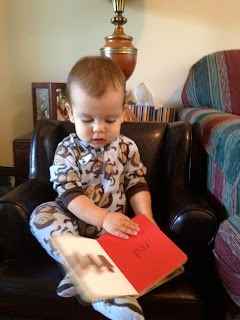 Baby Jonathan, who is 14 months young, is old enough to know where to get his books and--MORE IMPORTANTLY!-- where to put them away. This cubbie from Target is perfect for toddlers to independently get their things and to return them when finished. For the older kids it's nice to have adjustable shelves that are still low and stable but which can accommodate even big books. The baskets along the top (from Pottery Barn) are used to separate the four levels of easy reading books. I love Pottery Barn baskets! They are so versatile. I love the Montessori set up of your house and how Alleluia can easily get to everything and knows where everything goes! It has made a big difference in how J acts with his toys at home now that they are organized in specific spots and each toy has a place where it goes. Let see how much my home gets organized now. 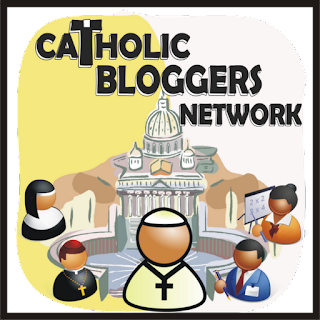 Thanks for this awesome post.